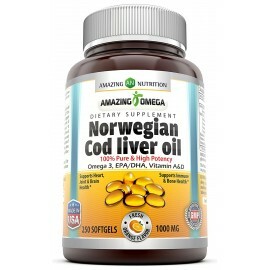 Cod liver oil, as the name suggests, is the essential oil extracted from the livers of Atlantic cod (Gadus morhua). The oil is commonly taken as a dietary supplement. It is one of the best sources of omega 3 fatty acids (EPA and DHA) and contains relatively high amounts of vitamin A and vitamin D.
*Imported & Shipped Directly from USA* Great lemon taste! Natural triglyceride for..